(L-R) Acheson, Harriman, Truman and Marshall – a funny thing happened on the way to Tehran . . .battleships. No shortage of global or domestic hotspots, this August 2nd in 1951. Starting with news of intense squabbling between branches of the military escalating to the point a Congressional investigation was called for. The endless carping was cause for concern, especially in Korea where the Army was having trouble depending on the Air Force for fire support during crucial ground actions. But the squabbling wasn’t confined to the Armed Forces – no compromise or settlement was reached in the latest truce talks in Korea. Seems the ceasefire zone was in dispute and no one could agree on where it was supposed to be. And the question “how much do you like Ike” was being bandied around Washington, as speculation arose over a possible run for the White House from General Eisenhower. Aside from not deciding whether or not to run was the decision of what to run as – Democrat or Republican. Only Ike knew for sure and he wasn’t telling. Speculation was also rife over whether or not Averell Harriman was going to replace Dean Acheson as Secretary of State. Harriman was on his way to Tehran to take part in talks regarding the Anglo-Iranian Oil dispute, which was taking on nerve-wracking proportions. Seems London decided it was a good time to stage Naval maneuvers in the Persian Gulf and so several battleships and destroyers were spotted looking ominous outside Iranian waters. Meanwhile. Influence Peddling was a hot topic on Capitol Hill this day, with the Bribery case of DNC Chairman William Boyle Jr. under scrutiny. Seems the Chairman was accused of accepting an $8,000 “love offering” in connection with an RFC loan. And protests were launched in connection with an attempted land grab by a group headed by former Auto magnate E. L. Cord of offshore oil wells in the Gulf of Mexico off Louisiana. And when all else fails, look for Communists. The HUAC Hearings continued. So much for life on Planet Earth for August 2nd, 1951 – all that an a lot more as reported by Don Hollenbeck, substituting for Edward R. Murrow and The News from CBS Radio. BY THE WAY – please make a donation to keep Past Daily alive and breathing. Make your secure and anonymous donation here: Past Daily Summer Fundraiser. You will have saved a lot of lives in the process. 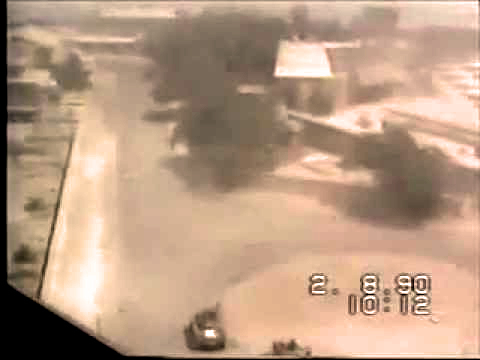 Kuwait: August 1990 – murky images – murkier motives. The sound of sabers rattling and reports of atrocities, chaos and quickly organized summits dominated the news for this August 10th in 1990. With the Iraqi invasion of Kuwait only a few days old, Egypt opened an emergency Arab Summit in Cairo as a last ditch effort to prevent an escalated war in the Persian Gulf against Iraq. But at the time of this broadcast, very little was accomplished, except when to break for lunch. Iraq sealed its borders to all but diplomats, and reports came flooding in of foreign nationals escaping in the droves, while some were being held in Bagdhad, perhaps as hostages. The ones who escaped gave harrowing accounts of what was going on in Kuwait and it fueled the already growing outrage against Iraq. Meanwhile, NATO leaders were stopping short of taking collective military action, but they did endorse the growing multi-national Naval presence shaping up in the Persian Gulf. And the U.S. began a rapid deployment of U.S. combat troops to the region, denying reports it would eventually deploy as many as 250,000 personnel to Saudi Arabia. Back in the States – wild fires were continuing to cause major destruction in Oregon and Northern California, charring some 100,000 acres as of this morning. Yosemite National Park was closed and all roads leading into the site were blocked, leaving many campers stranded. As of this August 10th, there were some 1,000 fires burning out of control in the region. And that’s some of what went on, this chaotic August 10th in 1990, as reported on The CBS World News Roundup. 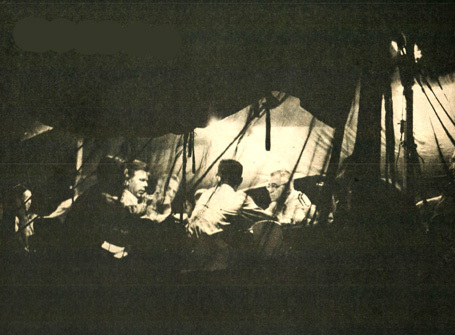 Vice-Admiral Charles Turner Joy and staff burning the midnight oil in Korea. News for August 2, 1951 centered around a disturbing development within the Military, and calls for a Congressional investigation were underway. Seems a rift between the various branches of the Armed Services had been going on for some time and it had finally boiled over into a public display in the form of a snub on the parts of the Navy and Marine Air Force towards the Army and upcoming joint maneuvers. Citing a historic disharmony between the various branches of the Armed Services, the Joint Chiefs of Staff vowed to take action. Taking no action on this day were the advancement of a ceasefire or further Peace talks in Korea, while fighting and propoganda continued. President Truman remarked, during his Press Conference, that he felt General Eisenhower could conceivably run for President without compromising his current duties in Europe. Truman added that he thought Eisenhower would run in 1952, but with which party still remained to be seen. Congressional protest was mounting over a privately funded group’s attempts at a takeover of offshore oil drilling in the Gulf of Mexico. Citing a government land proviso going back to the War of 1812, the group laid claim to some 1900 acres of land on which sat some 40 oil drills located off the Louisiana coast. House Un-American Activities Hearings were continuing and the House voted to halt aid going to countries supplying war goods to Soviet Bloc nations. Secretary of State Acheson was heading to Tehran to act as buffer for the British-Iranian oil dispute talks. Nerves were rattled at the presence of British Warships cruising the Persian Gulf on maneuvers. So nervous in fact that, a Soviet ship cruised by an Iranian military outpost and was immediately subjected to machine gun fire before turning around. Speaking of Dean Acheson, rumors were circulating that Averill Harriman was poised to assume the post of Secretary of State, starting as early as October, replacing Acheson who had been making overtures of leaving. The White House was quick to deny the reports. All this and a lot more for August 2, 1951 as reported by Don Hollenbeck, substituting for Edward R. Murrow and The News for CBS Radio.